Fairfield Warde High School social studies teacher James D'Acosta led two dozen of his freshman students on a day-long trip around the world Tuesday through the sanctuaries of the region's diverse religious communities. It was the 18th time the national board certified teacher took students on a religious studies field trip, but the first time he opened it to freshmen, as well as the first time that a Buddhist temple was on the itinerary. "The diversity of religious communities in our area strongly enriches my students' understanding of most of the world's major religions: Judaism, Catholic Christianity, Protestant Christianity, Islam and Buddhism," D'Acosta said. "The trip gives students the opportunity to learn from devout men and women with profound knowledge and understanding of their respective religious traditions in their sanctuaries. This is scholarship at its best: Asking an expert on their own turf to explain their subject." Religious leaders from a spectrum of faiths welcomed the students on the tour, including Congregation Beth El, Jewish; St. Saint Pius X Church, Catholic, and Greenfield Hill Congregational Church, Protestant, all in Fairfield; Masjid An-Noor/Bridgeport Islamic Society in Bridgeport, Sunni Islam; and the Tibetan Buddhist Center for Universal Peace in Redding, Tibetan Buddhism. The clergy put their respective religions into historical context about the central beliefs and practices of their faiths; talked about similarities that they recognize between their religion and others, and answered students' questions ranging from those about routine daily rituals to where their faiths stand on highly charged issues, including abortion and gay rights. Warde student Peter Siccardi, 14, said he chose to participate in the religious field trip because he thought it would be "a unique experience. ... You don't usually get to do something like this every day." Chiana Yang, 14, said she learned that the world's religions share in common an emphasis for adherents to be good people, to help change the world and make it a better place. They have the same motivation to be good, to adopt moral values and to be an inspiration, she said. "In society, you hear about a lot of different religions, but here you get to see the actual religions. You can see the true values, you can see the core beliefs," Yang said. "By learning about other religions, you can learn about people more and understand people and see how they are more alike and different from you." Imam Saleh Mohammed, of Masjid An-Noor in Bridgeport, said, "We try to do our best to be good people." At the Tibetan Buddhist Center, monk Jampa Gyaltsen told students that bad emotions and negative reactions to provocations are habits that can be changed through training of the mind to reduce anger, control impulses and actions, and cultivate good thoughts. "It is possible to train our mind to a perfect state," Gyaltsen said. "We believe there is a way to achieve that. That is our faith. ... That is his (Buddha's) ultimate blessing: the teaching of how to train our mind. We can all know how to make our mind more peaceful." Students asked the monk questions about the Dalai Lama, the relationship of martial arts to Buddhism, and what a typical day is like for him. Gyaltsen said they basically study, discuss Buddhist teachings, pray, meditate, and reflect on what they learned that day. "We shouldn't have too much (indulgence) in material things," but rather people should focus on the spiritual, he said. Gyaltsen said he was impressed that the Warde students were making an effort to learn about other people. That is one of D'Acosta's objectives for the field trip. "As well as supporting the curriculum, I expect the trip to help students to develop respect and tolerance of people from different backgrounds," D'Acosta said. "This trip also displays one of the strongest aspects of our American civilization; the strength we gain from the separation of church and state, from our institutionalized freedom of conscience and worship, and from the richness of our diverse citizenry." 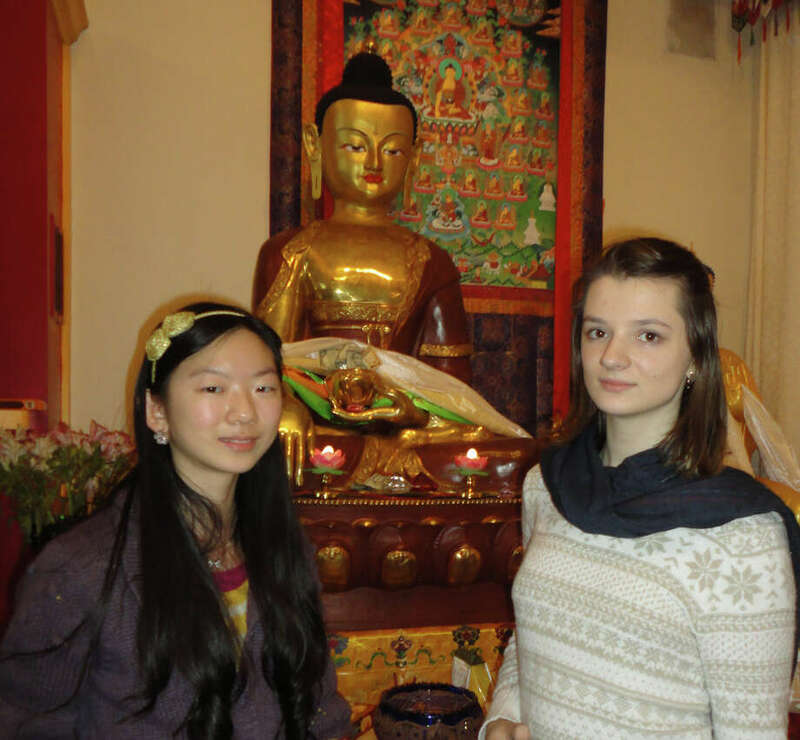 "It's interesting to see how all these religions are intertwined with each other," said Alisa Korneyeva, 15, who was especially moved by the trip to the Buddhist temple. "I think all this can be relatable to just about anyone because everyone experiences troubles with emotions. I will take on the advice not only from this temple, but from all the places we visited and use it to my advantage and possibly help others."